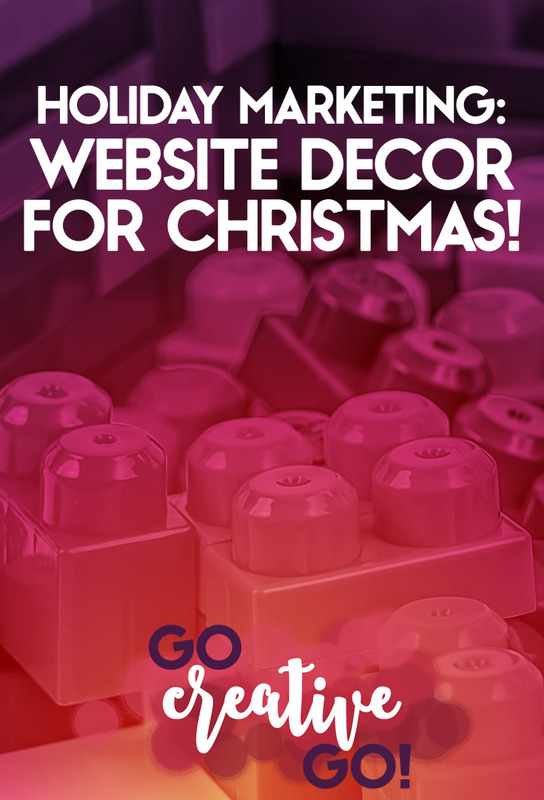 Holiday Marketing: Decorating Website For Christmas! - Go Creative Go! I love Christmas. It’s always been my favorite holiday. I love baking cookies. I love choosing gifts for family, friends and clients. I even love festively wrapping presents, as long as I don’t procrastinate and leave it all until the last minute. I’m one of those crazy crafty people, too. So I start making handmade gifts as early as September if I’m on top of things. I also enjoy holiday marketing. Helping my clients ready their holiday specials, sales, and more helps get me in the spirit. What I don’t like about the holidays, lately – at least? We can’t really decorate since we’ve added two animals to the menagerie. It was hard enough when Pixie, the dog, became a family member. Adopted after she was abused and abandoned under a dock, she’s got some anxiety and separation issues. If she’s not watched like a hawk she chews things up. Including low hanging ornaments and wrapped presents under the tree. It only got more difficult when I scooped a mewling black kitten out from under my car last year. Catt Damon is still a kitten, though she’s now just over a year old. She climbs EVERYTHING. And she takes great joy in helping Pixie destroy things by helpfully knocking them down for her. This includes ornaments, scented candles, etc. Many of the things that add a Christmas vibe to the house. We moved our holiday decorating vertical. We stack gifts on the top shelves of our bookcases, as well as across the mantle. We also hang our stockings and hang up a small burlap tree my sister made me. But that’s it. No standing tree, no pretty tree skirt, no garland over the banisters, no wreaths on the walls (yes, CD will knock those down for her pal to chew). I was feeling a little sad about it this year. Nothing over the top. Just a little sad that I couldn’t get out some of the sweet snowmen I’ve been collecting since I had a home of my own to decorate. Then it struck me! I Can Decorate My Website! Every year I decorate my social media accounts with festive cover images and regular posts featuring holiday imagery. I also design holiday marketing images for my peers and clients. It’s fun work and it certainly helps bolster my holiday spirit. When I was feeling a little holiday woe-is-me because we wouldn’t be putting up a tree, I realized I could decorate for the holidays with no broken ornaments, chewed on light strings, nor any stomped on presents. I could decorate my website! So I went to my favorite photography sites and carefully selected and purchased the images that suit both my holiday and brand style and I got busy. Go Creative Go Gets Festive! I’m very happy with my decorated site. It allows me to share a bit about my love of all things holiday and Christmas, and it also allows me to continue to embrace my #realyoureal biz mantra. Does my love of Christmas seem out of character when you consider my rather snarky delivery of the facts and fictions that go along with running and marketing a small business? Some might think so. My Christmas imagery might seem a bit soft if you’ve come to know me because of my sharing of hard truths. But, I decided earlier this year that I was going to share more of the real Mallie, and more of the realities involved in owning, marketing and successfully building a small business. And I believe I’ve been doing so. Adding some baubles and festive cheer to my website makes me happy. And if you’re not happy when you’re running a small business, you’re not going to deliver your best to clients and prospects. The holiday decor will remain up through the New Year celebration. And it’s a lot easier to clean up a website than it is to take down a tree and room after room full of Christmas decorations. Some of you are now thinking I might be on to something, aren’t you? Whatever you celebrate during this time of year, be real and true and be happy! Your clients, peers and prospects will appreciate it. Do take a look around the site and let me which page is your favorite! Twitter Tip: Random Tweets That Aren’t Random … Dear Social Media Santa Claus … A Wishlist!